Super Bowl XLV on Sunday evening set an all-time TV viewing record in America as an average audience of 111m people watched the Green Bay Packers beat the Pittsburgh Steelers, beating the previous record (the 2010 Super Bowl, 106.5m) into second place. But that isn’t the only positive news at the end of a 2010-11 season: average attendances did not plunge as drastically as feared, falling only 0.8 per cent year-on-year, according to analysis of crowd data by sportingintelligence. Average attendance for the 256-match regular season in 2010-11 was 66,960 people per game, down from 67,509, or a loss of only 549 fans per game, which in the worst recession for many decades was nowhere near as bad as anticipated in some places. 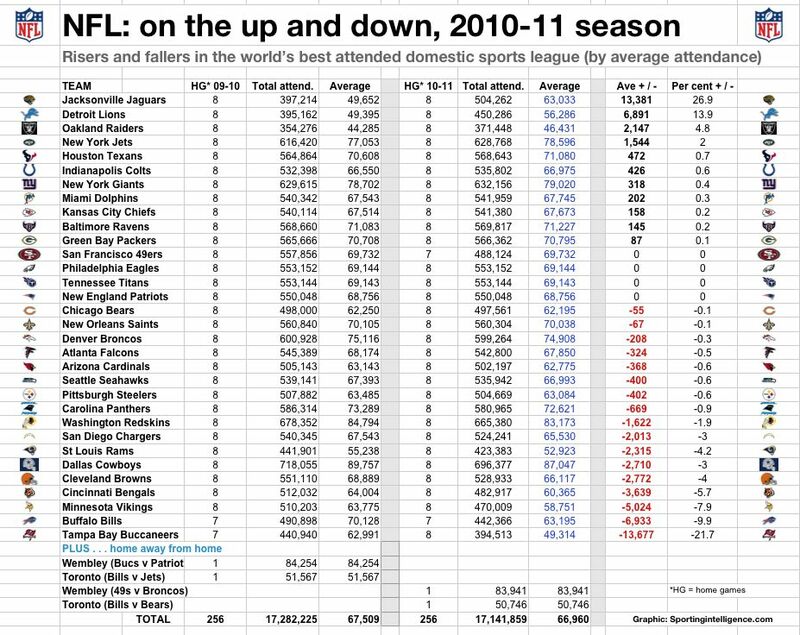 The upshot is that the NFL remains, by a massive distance, the best attended domestic sports league in the world by average attendance per game, ahead of the German Bundesliga in second place, and the AFL (Aussie Rules football) in third. The figures by team for 2009-10 and 2010-11 are in the table below. One word of caution: the research relies on the official figures reported per game, and in some cases, there have been suggestions of certain franchises reporting figures higher than actually attended. One example from October is linked here. But nonetheless, there have been some decent individual success stories in attendances alongside some cases of disturbing falls in numbers. Among the 32 franchises, 11 reported increases in average attendance (seven of them by less than one per cent), four franchises stood still (the 49ers, Eagles, Titans and Patriots with identical season-on-season numbers) and 17 franchises recorded downturns (eight of them by less than one per cent). The biggest gainers were the Jacksonville Jaguars (up a whopping 13,381 fans per game, or 26.9 per cent), but then their 2009-10 numbers had been notable for being so low and action had been taken to bring the crowds back. The biggest losers by a distance were the Tampa Bay Bunnaneers, owned by the Glazer family who also owned Manchester United of the Premier League. The Bucs’ average crowds plummeted from 62,991 in 2009-10 to 49,314 in 2010-11, a loss of 13,677 fans per game, or a painful 21.7 per cent decline. At the time of writing (Tuesday afternoon, UK time, 8 February), the Bucs’ website home page includes the sales pitches ‘Tickets lowered up to 30% from 2010′ and ‘Youth tickets starting at only $17.50 per game’. The other significant shadow over the NFL is the possibility of no season at all in 2011 because of the ongoing salary dispute.